The HDMI HD UHD Video Extender is designed to help extend an HDMI signal via HDMI cable for a distance of up to 15 metres for HD 1080p and up to 10 metres for UHD 4K2K resolution. The HDBaseT HDMI over CAT5e/6 Transmitter & Receiver with dual PoE is ideal for use with CAT5e/6/7 cable and is designed to transmit and receive an un-compressed HDMI HD and UHD video and audio stream over a long transmission distance of up to 100 meters (382 ft). This is achieved with no loss or degradation to the HDMI signal strength or quality. Take full control of your Home Theatre system by connecting all of your standard and high definition AV devices to our Multi Video to HDMI and VGA Scaler Converter, designed to facilitate connection and selection of the attached AV devices to display on a HDTV at high definition 1080p HDMI or WUXGA PC resolutions, without having the hassle of swapping around cables! Our new Digital Co-ax to Analog L/R Audio Converter (with Dolby Digital and DTSM 2.0 Decoder) is designed to support LPCM 2CH, Dolby Digital and DTS (Dedicated To Sound) digital audio formats and downmixes all to a left and right, 2 channel analog audio output. 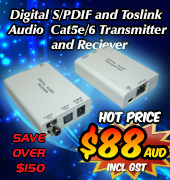 Select and convert your PC’s audio files to an Optical or Coaxial audio format and stream this signal via the PC’s USB port to a Home Theatre amplifier, active speakers or headset using our USB to Optical Audio Converter - up to 192kHz (ID#15447) and the USB PC to Coaxial Audio Converter - up to 384kHz (ID#15448). The new 4x4 HDMI UHD 4K Matrix Switch is the latest release in our range of quality video switching systems, all designed to support video resolutions across HDMI 1080p, UHD 4K and 3D formats. Save hundreds of dollars when upgrading to the new world of digital video and audio. Don’t be conned into believing that you will no longer be able to watch your favourite TV shows or video clips simply because they only play on the old, defunct analog technology. The day of the Analog to Digital Video Converter has arrived. Most HDMI video systems are designed to work primarily with HDMI 720p resolution, 1280*720 pixels. This High Def (HD) standard works well for the majority of HDMI displays, but did you know that much more can be achieved by using a high quality HDMI to HDMI converter. The IP VoIP Video Manager and Controller is a flexible solution for controlling multiple Video over IP (VoIP) Extenders all within the same network. The Digital/Analog Stereo Audio Amplifier outputs both digital and analog LPCM 2CH audio for replay on un-powered 20W 4Ω speakers. The new Multi Video to HDMI UHD Scaler is an organiser designed to assist with the connection and selection of video sources to any size HDMI TV. Compatible with VGA, Displayport and HDMI video formats, the Multi Video to HDMI UHD Scaler adds clarity and quality to any Home Theatre System. Video and Audio Converter sale of high quality DVI, PC and HD to HDMI video Scalers, multi-input audio Switches and Category 5e/6 cable line transmission products, all reduced to near cost price for quick sale to our lucky customers. New release HDMI over CAT Cable Wall-Plate Transmitter with 48vDC PoH is designed for the flawless transmission of UHD signals up to a distance of 100m, or 328ft, over a single CAT6/7 4 pair cable. The new 4 Way HDMI UHD+ Switch can support simultaneous connection from up to four source HDMI UHD+ 6G video signals, then select from one of the four video inputs the video signal to extend to the attached HDTV for viewing. Our range of high quality single input to two, four or eight output HDMI 4K2K Splitters are now on sale through our on-line Converters.TV website. HDMI EDID (Extended Display Identification Data) is an in-built electronic feature that allows the source device, such as a Blu-Ray player, to “communicate” with the attached HDTV display. Send UHD 6G 4K2K and 3D Video and Audio over category 5, 6, or 7 cables using the improved HDMI over CAT Cable Transmitter and Receiver set. The new 4K HDMI 4 Way Splitter is designed to support the replication of an Ultra High Definition (UHD) 4K video and audio signal into four separate, but equal, UHD 4K video and audio signals. The HDBaseT to Dual 4K HDMI Scaler with Audio Re-embedding is the receiver end of the HDMI to HDBaseT Scaler with Audio Output (ID#15461) and supports 4K UHD video and audio signals over CAT5e/6/7 cable up to 100m in distance. The HDMI to HDBaseT Scaler with Audio Output is designed to support, convert and transmit uncompressed UHD HDMI video and audio along a single length of CAT5e/6/7 cable. 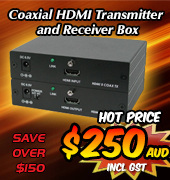 New HDMI Scaler Box scales and converts HDTV HDMI video, up to 1080p, plus PC signals up to WUXGA resolution, to other selectable HDMI and PC timings. Our latest HDMI/VGA to HDMI 6G Scaler accepts standard def to full high def 1080p HDMI video, or up to WUXGA for PC resolutions, and upscales all to output at a selectable 4K2K HDMI resolution. The UHD 6G HDMI Analyser and Pattern Generator is the latest generation of video signal testing tool and replaces the superceded ID#727 HDMI v1.3 Compliant Video Test Pattern Generator. New Ultra High Definition 4K2K Splitter and Scaler with Audio De-Embedding allows a digital HDMI video and audio signal to be split into two identical digital HDMI video and audio signals. The two independant signals can then be upscaled or downscaled in resolution, or passed through as the original resolution. New 4K2K HDMI and VGA over Ethernet Extender is ideal for commercial and private use where an active Gigabit Ethernet network is available. 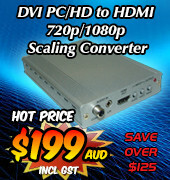 Great range of stocked, quality HDMI Switchers, Splitters and Extenders are available during our stock clearance sale! All stock earmarked for this sale have had pricing greatly reduced, with some prices never to be repeated! The HDMI 4K2K Analyser and Enhancer is designed to sample HDMI High Definition (HD 1080p) and Ultra High Definition (UHD 4K2K) video/audio streams and uses LED lamps to display the signal characteristics. Video CV-SV 4x1 Switch connects and selects between four standard definition Interlaced Composite (CV) and Super video (SV) signals for display on a standard definition television (SDTV). Full support is given for NTSC and PAL video formats and analog stereo left/right audio. No more need to swap over tangled cables whenever you want to use a different video source with your SDTV. Simply use the hand-held remote control or panel mounted soft-touch buttons to effortlessly select your input. The Video CV-SV 4x1 Switch is perfect for use with older style standard definition video/audio players and arcade game consoles. New HDMI Seamless Quad 4 x 1 Picture in Picture Processor CDPS-41SQN is now available from our on-line shop. Connect and display up to four individual HDMI video signals onto one HDTV, in various display scenarios. New HDMI UHD 4K2K Audio Inserter is designed to allow an external Analog or Digital audio signal to be combined into an HDMI priority signal. It combines, synchronises and re-shapes the new audio signal with the original video signal, producing a new seamless HDMI video/audio priority signal. Full support given for resolutions up to UHD 4K2K and supports Analog L&R and Digital LPCM, DTS and Dolby 2CH/5.1CH, Dolby Digital Plus, Dolby TrueHD and DTS-HD Master audio signals. The HDMI 4 in 1 out 4k2k Switch converter box is a new feature product that truly an impressive piece of technology, designed to streamline and simplify your visual media set up. The new HDMI Power Inserter tool is designed to increase the power supplied to an HDMI video and audio signal, increasing the effectiveness of HDMI cable to a distance greater than 3, 4 or 5 metres. With the ability to provide power to both the input and output sides of the HDMI cables, the total HDMI cable distance achieved at 8-bit Colour is 16m (8/8) and for 12-bit Colour is 10m (5/5). Now extend your signal between rooms or between floors by cascading a number of HDMI Power Inserters with HDMI cables to maximise the HDMI cable’s transmission distance by up to 35m (3 cascades). New HDBaseT HDMI UHD Receiver and Scaler is designed to connect one input via HDMI to a video/audio source and the other input via HDBaseT CAT5e/6/7 cable carrying a different HDMI video/audio source. Either input can then be selected to be displayed on to two UHDTV’s. Full support is given for HDMI HD, UHD and 3D video signals, plus PC signals up to WUXGA in resolution and with the ability to scale the received signals to best match your HDTV’s. Digital audio is transmitted with the video signal, with a separate Analog L & R audio output for connection to external active speakers or an amplifier. The HDBaseT HDMI UHD Receiver and Scaler is ideal for use in Advertising, Commercial and Educational facilities, as well as Private Homes. New Video Wall 1 by 4 HDMI UHD Splitter is now available through our Converters.TV Internet Shop. Display one HDMI UHD (Ultra High Definition) 4K2K video signal on to four individual screens located anywhere around a room, or when constructed as a 2x2 Video Wall Screen, the video signal can be displayed as one large image over all four screens. At the same time you can upscale the resolution of the video signal through the Splitter to best utilise the UHD features of the four screens. The Video Wall 1 by 4 HDMI UHD Splitter gives full support to HDMI Standard & High Definition (SD & HD) video and UHD 4K2K video and mainstream digital audio formats such as LPCM, Dolby and DTS. Newly released to our market, the latest technology HDMI UHD 4k2k signal splitters are designed to copy one HDMI video & audio signal into two or more equal HDMI video & audio signals, without any data loss or degradation. Designed to work with all HDMI signals up to the new 4k2k Ultra High Definition resolutions, these high quality splitter devices allow for high speed data transmission rates of up to 9Gbps. Each output HDMI signal is an exact copy of the input HDMI signal, each one re-shaped and re-timed for perfect HDMI signal reproduction. New HDMI Audio with Dolby Digital and DTS 2.0+Digital Out Decoder has been released and is designed to simplify the integration of Dolby Digital and DTS audio formats into your own Home Theatre Sound System. HDMI incorporates video and audio streams in its signal. The digital audio streams are usually in the format of an un-compressed LPCM 2CH signal and compressed Dolby Digital and DTS signals. The HDMI Audio with Dolby Digital and DTS 2.0+Digital Out Decoder extracts these audio components from the HDMI signal, decodes and converts them, then presents them as digital Coaxial and Optical audio outputs and an analog L/R audio output. Connect any of the digital or analog audio outputs to external speakers or Home Theatre amplifier system for perfect sound reproduction. The latest addition to our range of Multi-frequency LCD panels are 15 Inch and 19 Inch Multi-frequency LCD Capacitive Touch Screen Panels. These new Multi-frequency LCD Capacitive Touch Screen Panels are ideal for replacing older touch screens in Industrial CNC machines and Arcade Gaming cabinets. Using latest 3M Touch Technology, the accuracy and response time when detecting touch commands around the screen enhances the overall performance of the Multi-frequency LCD Capacitive Touch Screen Panels. The panels can now be used in many scenarios and are not limited when it comes to displaying low and high resolution CGA/EGA signals from Touch Control systems. The new HDMI 4k2k Repeater 1 In 1 Out has been developed as an advanced solution to overcome High Definition (HD) 1080p and Ultra High Definition (UHD) 4k2k video signal loss over the length of an HDMI cable. When displaying HDMI video content on a HDTV at resolutions such as HD 1080p 12-bit colour and UHD 4k2k, the signal loss can be quite dramatic over short distances. At standard definition (SD) resolutions such as 480p and 576p, the loss over the distance is usually not a problem, but video quality is low! The HDMI 4k2k Repeater 1 In 1 Out overcomes HD signal loss by equalising and amplifying the signal to a higher level for a much longer transmission distance. Our range of Industrial Multi-Frequency LCD Monitors are best suited for the retrofit of older low resolution CGA 15kHz & EGA 24kHz CRT monitors, as found on most types of Industrial machinery. Manufacturing machinery such as Steel Press machines, Plastics Extrusion machines, Lathe machines and Tyre Changing machines rely on visual displays for operation. Most CNC machinery in use today still use CRT displays for the visual setting up and control of the machines programming and performance. Once these displays go faulty it is near impossible to find a similar, cheap replacement monitor. This New Audio Controller allows user with flexible and distance control over audio performance. With L/R & Optical inputs to L/R output, this device provides a digital to analog conversion or analog to analog bypass function. Controls like Telnet & Web GUI allow user with easy adjustment and remote over audio output. On-panel control with LED indication adds-on the friendly use for the device. The HDMI over Optical Fibre Transmission Kit is designed to transport High Definition digital video and audio signals up to a distance of 300 metres (1000 ft) without signal loss or degredation. One single optic-fibre is used for bi-directional signal transmission between a Transmitter and Receiver. The Optical Fibre Transmitter and Receiver Kit gives full support for HDMI HD digital video up to 1080p timing and PC VGA up to WUXGA resolution. LPCM 2 CH digital audio is also supported and the system is HDCP compliant. Control functions like remote control IR and PC RS-232 protocol transfer are in-built to the Transmitter and Receiver units, forming part of the transmitted data stream. This new HDMI Audio with Dolby® Digital/DTS® Decoder allows an HDMI input audio signal to be extracted and simultaneously split to both digital and analog audio output. Eliminating audio termination or stuttering sound on enjoyment of audio entertainment world. This device allows you to maximize your audio signal to different external speakers or extend it to a various audio signal pathway. This new HDMI and Audio over Single CAT5e/6/7 Transmitter and Receiver set can send uncompressed audio/video along with controls, IP and USB data over a single run of CAT5e/6/7 cable up to 100m. It has the added benefit of control through the built-in RS-232 and IR ports. With LAN serving connection and external digital & analog audio capability that gives users the convenience of additional audio connections. This system also allows the connection of any USB host, enabling a USB connection to up to 2 USB ports, giving the Receiver the ability to act like a USB hub. The 48V PoE design can power the Receiver (PD) from the Transmitter (PSE), eliminating the need for a separate power supply for the Receiver. This new HDMI and Audio over Single CAT5e/6/7 Transmitter can send uncompressed audio/video along with controls, IP and USB data over a single run of CAT5e/6/7 cable up to 100m. It has the added benefit of control through the built-in RS-232 and IR ports. With LAN serving connection and external digital & analog audio capability that gives users the convenience of additional audio connections. This new 4K2K 6G 4 by 2 HDMI Matrix allows you to manipulate 4 input signal switching into two 6 G displays simultaneously. It supports 4K2K, 36-bit Deep Color, Hi-Def audio and other features defined by HDMI specifications. The device can be operated easily through Telnet, Web GUI, IR and on-panel controls. New HDMI v1.3 3 in 1 out Switcher with CEC & EDID control is available to order through our Converters.TV store. Connect together and control your HDMI source equipment and HDTV using this compact device. Three (3) HDMI source devices like Blu-Ray and DVD players, Set Top Boxes and Game consoles can be connected at the same time ready for instant display by a very simple push button selection. Full support also given for up to 1080p HD video resolution and digital audio formats like LPCM 2CH, Dolby Digital TrueHD and DTS-HD. The new Wall-plate Control System is a fantastic and useful design for system installer and smart home user. With 15 direct macro command buttons which allows up to 16 commands to be execute within one push and a total of up to 128 commands capacity inside this box that can bring out a set of scenes in a seconds. This new 4K2K 4 by 4 Matrix with fast switch and control system allows 4 HDMI signal sources displayed in 4 connected HDMI displays in the way you like and with fast switching technology the device can greatly eliminate the time required by swapping or turning ON/OFF the connected displays. The newest 8 by 8 HDMI 4K2K Matrix over CAT5e/6/7 is the most powerful HDMI 4K2K Martrix which supports the transmission of video (resolutions up to 4K2K Full HD & HDCP 2.2), multi-channel digital audio and control via IR, RS-232, Telnet or Web GUI from eight high definition sources to eight outputs over a single CAT5e/6/7 cable (up to 100m) for each output.